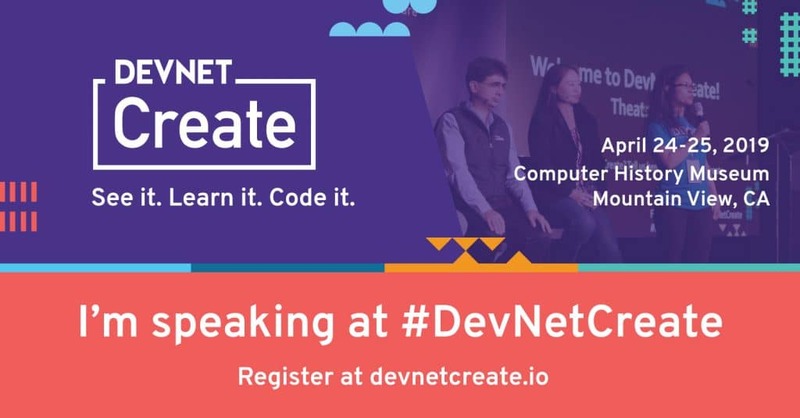 On April 24 and 25, 2019, NetBeez will be attending Cisco DevNet CREATE! DevNet is Cisco’s developer program. It was established to help developers and IT professionals who want to write applications and develop integrations with Cisco products. The DevNet CREATE event is Cisco’s annual conference for Net DevOps that will be held, for the second year in a row, in Mountain View at the Computer History Museum. The first DevNet CREATE event was held in 2017, in San Francisco. At this conference, dozens of speakers from Cisco and its partners, get together to showcase the technologies, integrations, and products that have been developed as part of the DevNet program. This year, NetBeez is presenting on April the 25th as well in a lightning demo titled, “Collecting Network Performance Analytics from a Swarm of Network Sensors”. NetBeez has proudly been a Cisco partner since 2017. Our affiliation with the DevNet program started in that same year. In 2017, we developed an integration with the Cisco Integrated Service Router (ISR). The NetBeez ISR integration enables Cisco users to run a NetBeez agent as a virtual service on top of an ISR router. This functionality simplifies the deployment of NetBeez agents at remote branches. In 2018, I read on DevNet about a new virtualization framework for the Catalyst 9000 (Cat9K) series switches called App Hosting. The Ca9K is one of the most deployed and well-known enterprise switches in the world. Deciding to have an integration with this platform was easy. On top of that, App Hosting is based on the Linux’ Kernel-Based Virtual Machine (KVM). Creating a NetBeez virtual agent for KVM is a very easy process (and well documented by Fabrizio Maccioni). I am pleased to report that in 2018, we released the NetBeez Cat9K integration! My Lightning demo “Collecting Network Performance Analytics from a Swarm of Network Sensors” will focus on the network performance analytics data that is available via the NetBeez API. As I will explain, the NetBeez data can be used to build service status dashboards at large and distributed enterprise networks. Here, end-users can check the dashboard to verify if their network is performing well or not, at all of their locations. Another use case of the NetBeez API is to feed end-to-end performance measurements to other applications that need a comprehensive view of the network. I am very excited for the upcoming Cisco DevNet CREATE event in Mountain View. At this event, I am planning to connect with as many speakers, attendees, and event organizers as I can. Building applications for computer networks has been an interest that I have had since my early twenties. I hope that this event will reinvigorate my love and passion for computer networks, software development, and engineering in general.